For over two decades UP! 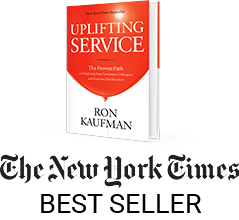 Your Service Founder and Chairman Ron Kaufman has helped companies on every continent build a culture of uplifting service that delivers real business results year after year. Making transformation his mission, Ron is one of the world’s most sought-after educators, consultants, thought-leaders and customer service speakers on the topic of achieving superior service. Ron understands the only reliable way for a company to achieve and maintain a competitive edge is to build a culture that empowers every employee to surprise and delight customers and colleagues every day with truly uplifting service. Packed with real stories and powerful examples, The Future or Service Excellence will inspire, educate and motivate you to focus your team towards progress, performance and profit, through proven and easy-to-apply customer service techniques and mindset. The workshop brings clarity, in an entertaining and upbeat manner, giving you the action steps you need for immediate service improvement. Companies with a powerful service reputation and an Uplifting Service culture are attracting and retaining the best talent, achieving market leadership and enjoying sustainable success. Packed with case studies and best practice examples from companies around the world, participate in this presentation to find out what works, what doesn’t, what your organization should do, and what you must avoid. 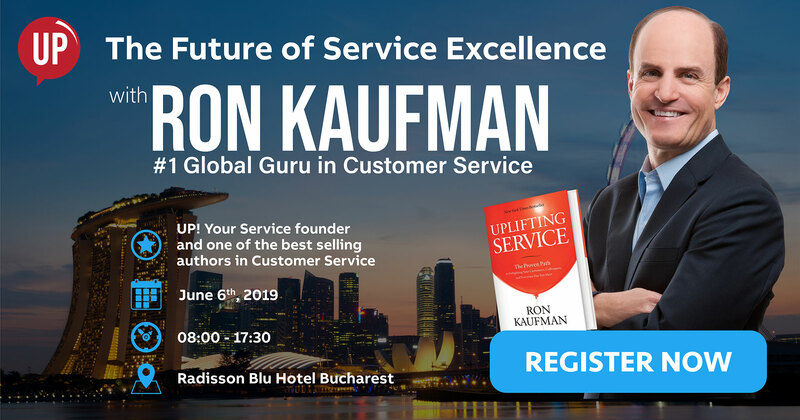 Join us at The Future of Service Excellence event with Ron Kaufman. Please fill in the form below or write to us at hello@upyourservice.ro and we’ll get back to you with next steps for registration process.